Temperatures in the Coachella and Yuma areas peaked in the upper 90s early this week, serving as a reminder that summer is around the corner. High winds also accompanied the higher temperatures and were felt throughout California. No damage was reported from the windy conditions, but the high temperatures certainly had an effect on produce. For grape growers in the Coachella district, the heat was very much welcomed, given the overall cool winter which resulted in minimal warmth in the area up until now. Growers were looking at a delayed start but the hot weather has come just in time. 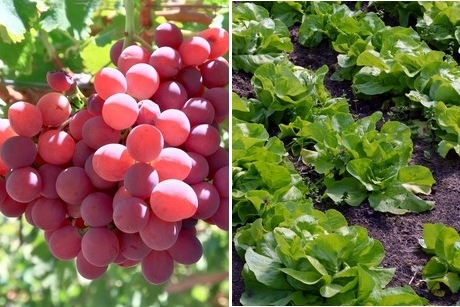 "The hot weather at the start of this week has helped the plants to grow faster," noted Franz DeKlotz of Richard Bagdasarian Inc, synonymous with the Mr. Grape label. "It provided a lot of heat summation units, which build when the average temperature is above 50 degrees. Recently, we have experienced cooler than average temperatures which has pushed the start of the grape season back a little. The higher temperatures will hopefully bring the start date closer to what we are used to. So overall, we are quite happy." DeKlotz said the company also grows peppers and eggplants and with the season just about to start, the heat provided an impetus for these commodities as well. "Our season for peppers and eggplants is due to start on April 22 and it typically goes through June," he shared. "More heat extends the growing period. When we have temperatures averaging above 65 degrees at night, the plants essentially grow 24/7." If the lettuce and leafy green season wasn't already finishing up in the desert districts, it certainly would be now. Growers of lettuces and other leafy greens are currently in the process of transitioning to Salinas this week. Therefore, the heat this week will only serve to speed this up. "Anytime you get a spike in temperatures like we just had, it accelerates the growth of plants," noted Mark McBride of Coastline Family Farms. "The volume switch between Salinas and the desert has already been flipped and we expect there to be very little remaining down there in the front part of next week." Although temperatures are lower again now, the process is not going to be reversed, as growers note that at this time of year, it's only a matter of time when 100 degrees is on the cards again. The reported windy conditions have not caused any damage even in the new growth up in Salinas. "Tuesday we certainly had gusty winds up and down the entire West Coast, including Salinas," McBride observed. "However, the younger plants are in better shape to handle these conditions and there hasn't been any damage reported. We are looking forward to getting going in Salinas after the difficulties Mother Nature presented to us during the winter." McBride did however, note that the market can expect some supply disruption in the coming weeks when the effects of the heavy rain earlier this year will make a mark on production. "After a smooth start, we can expect some swings in volume as well as quality a few weeks into the Salinas season," he said. "Everything was planted according to schedule for the early product, but the rains did cause some delays in subsequent planting and this will likely lead to some disruption in supplies in a few weeks' time." The forecast for the rest of the week in the desert is for milder temperatures to prevail before climbing back into the upper 90s again by next Thursday.